Nahji’s outfit consist of the Liberty Jane mini skirt and the Liberty Jane King’s Canyon Peplum top. 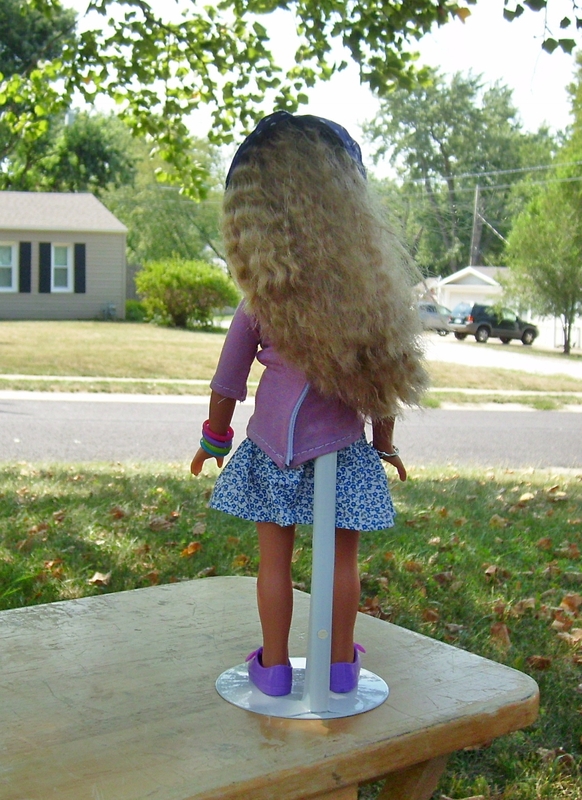 I have already reviewed the skirt with Dell’s outfit. So this will just be the King’s Canyon Peplum. Intermediate sewing level is probably about right for this project. It requires a light weight fabric which if you are not use to can cause problems. I used rayon challis that I had left over in the scrap bin. Rayon challis does require a lot of pinning as it is slippery. As I really didn’t have any trim that I wanted to use it does seem a little plain on the front. I probably should have used one of the decorative stitches from my sewing machine. Or maybe I shouldn’t have done the split at the neck line. I am not sure. It fits Nahji well and really wasn’t hard to stitch together. It does require having the right fabric suggestions to get a great drape. I double rolled the peplum hem and that did cause it to stick out in the rayon. Lauryce’s skirt has been done since early July . But I have been horrible about taking time to take pictures. 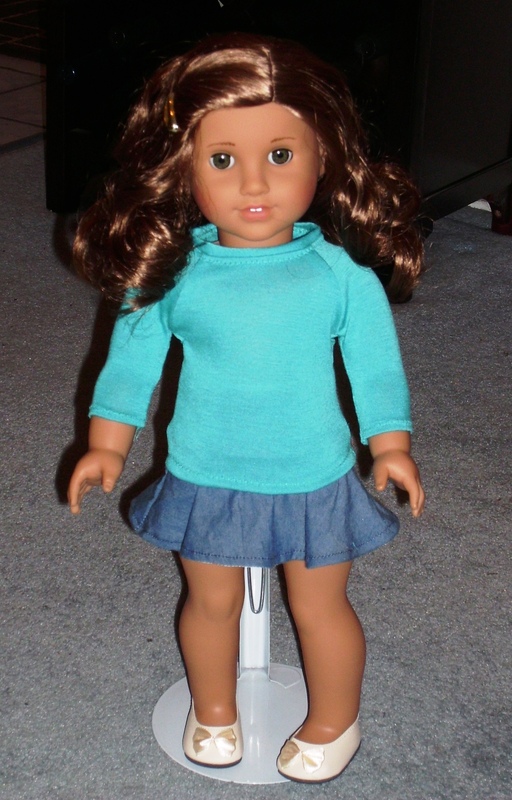 There is at least 6 other doll items plus a couple of items for myself still needing pictures. Lauryce got the Harajuku skirt from Liberty Jane. It was in the Hearts for Hearts/ Les Corrolles section so not the Wellie version. All I remember is that this was extremely fast to sew. I think I had it completed in one evening from cutting to end. I know that I would have done as much as possible flat (even the hem) then put the elastic at the waist. Lastly was seaming up the back. Lauryce’s skirt is from left over quilting cotton I had from the grey suit I previously made. Her top is Liberty Jane’s baseball tee which was previously made. Dell is up next. 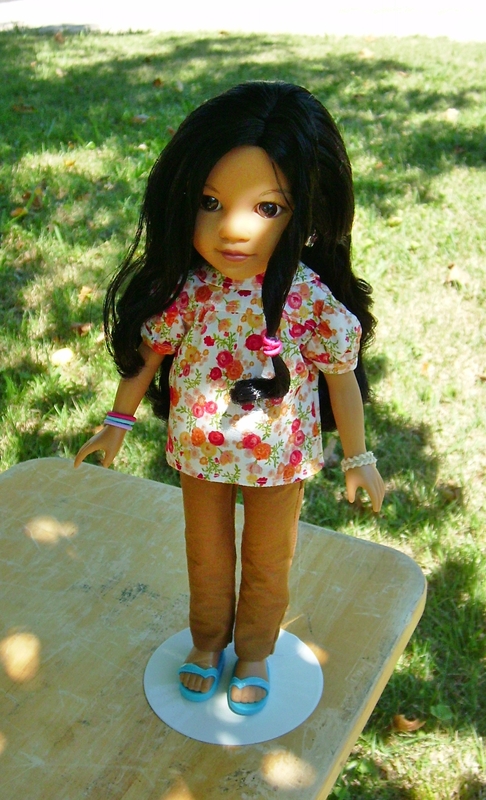 Dell’s new outfit consists of Liberty Jane’s gathered t-shirt and Liberty Jane’s mini skirt pattern. Dell’s t-shirt is made from ITY knit leftover from a dress I cut for myself (which is waiting to be put together). I really like the finished t-shirt. But my biggest complaint is that it didn’t include a neckband piece. So instead of turning under and hemming, I cut out a band matching the width of the little arm cuffs and longer than the neck line length. I basically used it as a facing and turned it to the inside and stitched down. I just used the standard 2 rows of basting stitches for the gathering. All the gathering was fairly easy even with the knit fabric. 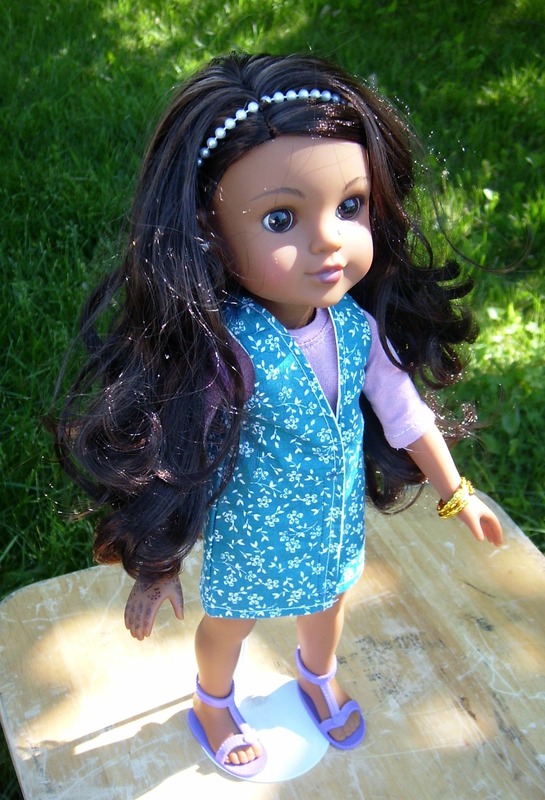 The Liberty Jane mini skirt pattern is sized for Wellie Wishers and Hearts for Hearts dolls (14.5 & 14 inch dolls). I had cut out four of view A from Kona cotton. I only ended up with 3 skirts because I figured I needed to bring in the side seams for my Hearts for Hearts (since they are smaller than Wellies). 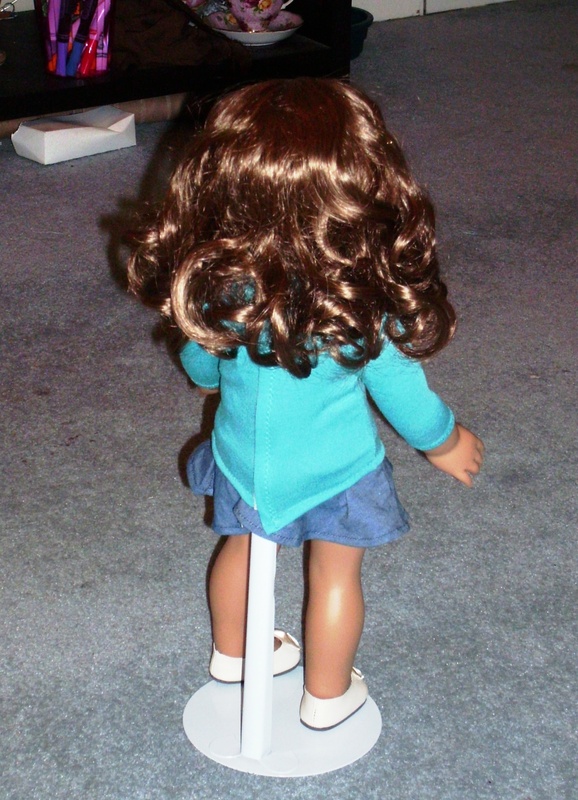 So the first skirt did not fit on my dolls and I was not going to go through fixing it. 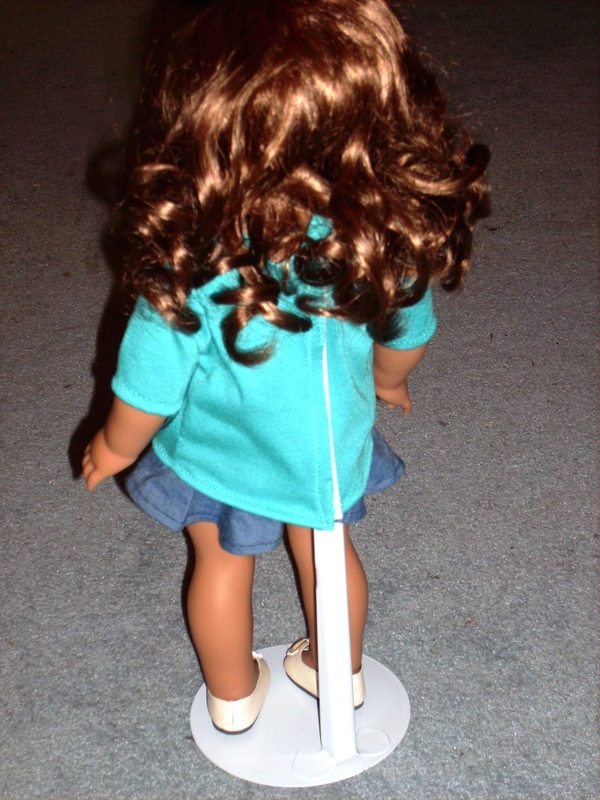 After the first one, I used the recommended quarter- inch for side seams and the fit is fine for my dolls. Now if you have a Wellie Wisher, you may want to consider including a bit more wearing ease so the skirt is easier to pull on and off. In that case, my recommendation would be to get your extra width from the center front and center back seams. For View A, I had to fold the front and back fabric pieces and then stitch in a faux felled seam. That faux felled seam is where I recommend getting your desired width if necessary. I did like how Cinnamon has you finish the side seams because it does give you a nice waistband finish. It may not be the best method for complete beginners as afterwards, you have to sew the front waistband down in the round. A small 6 inch or so waist is pretty tight to do in the round. 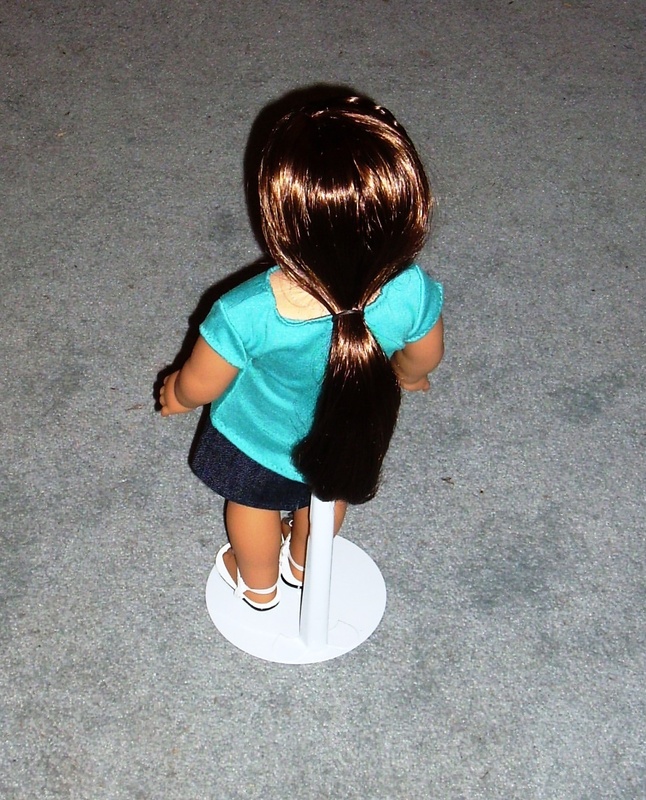 The American girl sized dolls are probably easier to complete like this. 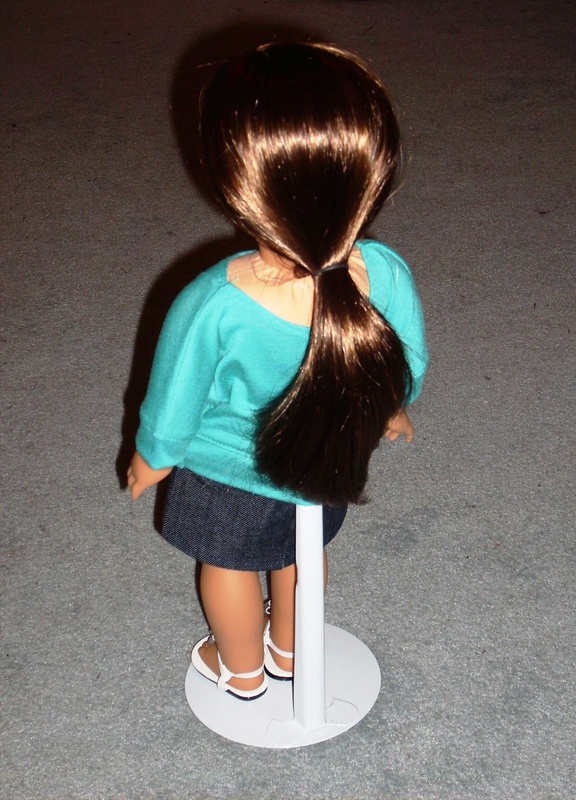 For me, it was slow sewing and constantly trying to make sure I was able to move the skirt and able to see. 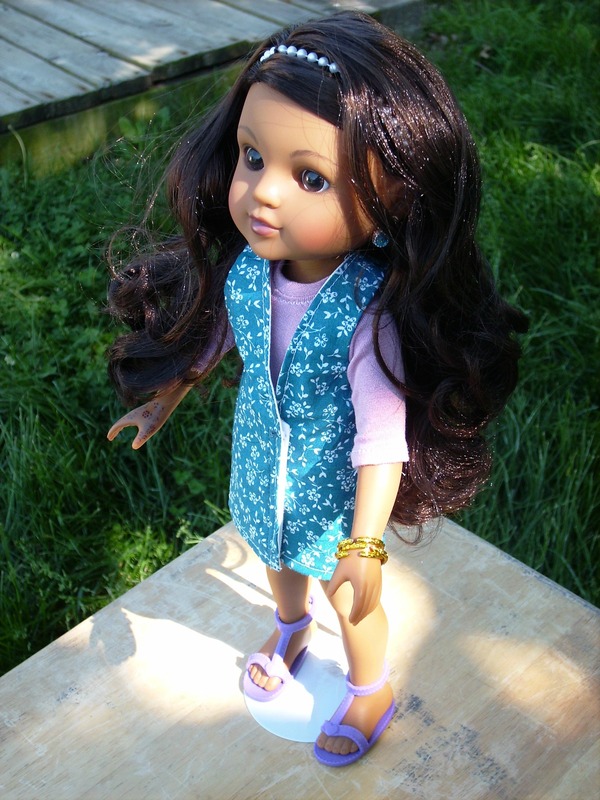 Tipi was the first doll to get a completed outfit (but that is because I used a previously made Wren Feathers gathered blouse). Tipi’s pants are from Kona cotton. I pretty much followed the directions of the pattern except for I did not want to insert my elastic in the round. This time I left one side seam undone but finished off the in-seam so I would be able to hem the second leg easily. After that, I inserted the elastic and tacked the end of it down. The final side seam was pinned then sewn and finished with zig-zag stitch. Side seam was trimmed and I feel that gave me a nice easy to make finish. This small of a size may have been difficult to complete in the round on a sewing machine. I am not sure I would want to hand sew it as you do need the waistband to be strong. My hand-stitching may not be professional enough for this sort of task. I finished all the seams off with a small zig-zag stitches then trimmed off the rest of the seam allowance (it wasn’t that much). Another Hearts for Hearts Girls outfit. 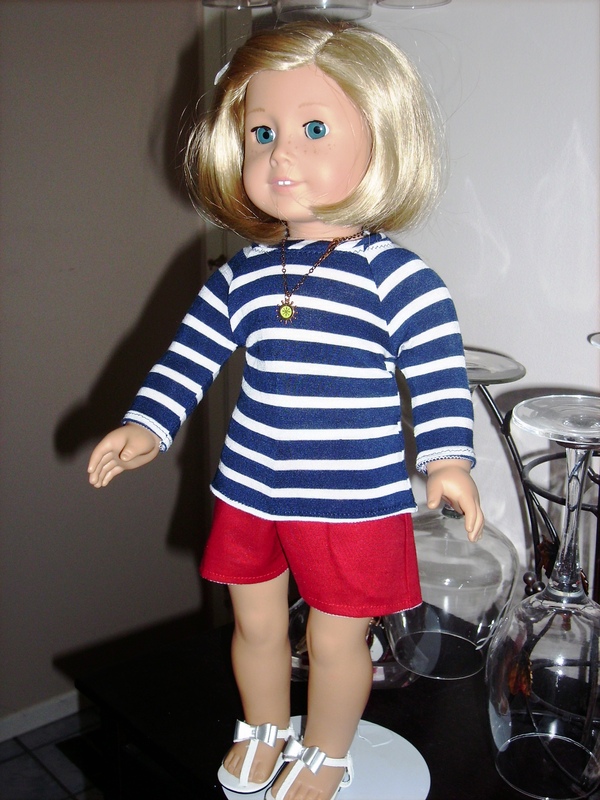 This time I made Dell the Liberty Jane UK Holiday outfit. Lately, I have been using my 1/4″ guide quilting foot for my Pfaff Ambition. It has been really great and easy to use. Liberty Jane suggest that the skill level for the UK Holiday outfit is intermediate. The intermediate rating is more in likely because of the knit fabric choice. Otherwise the pattern was very easy to assemble. 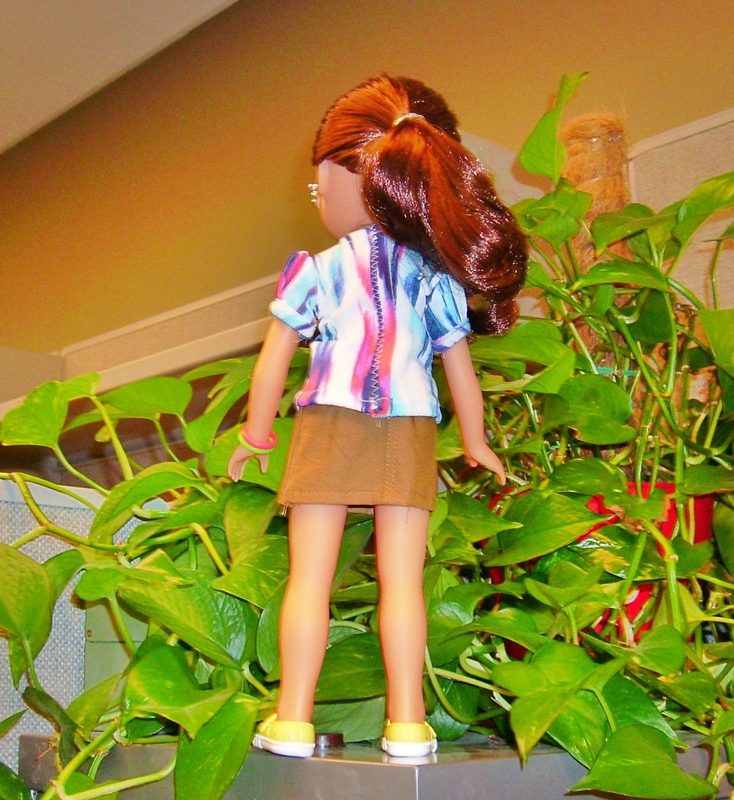 For Dell’s top, I used a rayon lycra jersey knit. It is especially important that the knit for the top be very light and drapey. 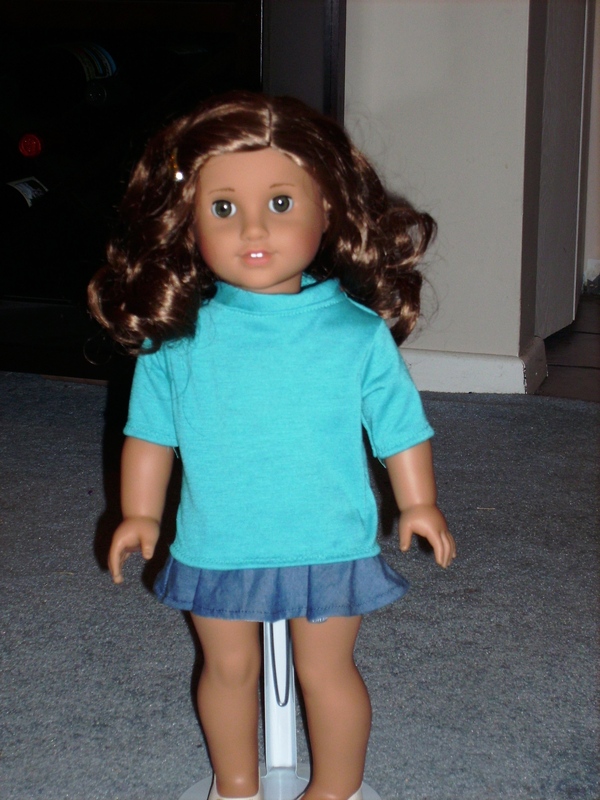 If it isn’t, then the top will not look great and be pretty bulky looking on your doll. To make the waist elastic casing and the casing at the bottom of the sleeves, I used my beige colored Hug Snug binding. I used 1/4 inch elastic for the entire top. Even though the top was a fairly easy sew, I am not sure I like it enough to use the top pattern again. I think this is more personal preference than pattern issues. However, I do like the legging pattern and will be using that more in the future. Dell is currently wearing the leggings using a stretch knit denim looking fabric. I used the 1/4 inch elastic for the waist of the leggings. If I am remembering correctly, I think the leggings took under an hour to make. I finally caved in and bought the Hearts For Hearts Nahji doll. Nahji is so much prettier in person than the stock photos on Pixie Faire show. Just in case you haven’t heard about Hearts for Hearts girls, please definitely check out their website. 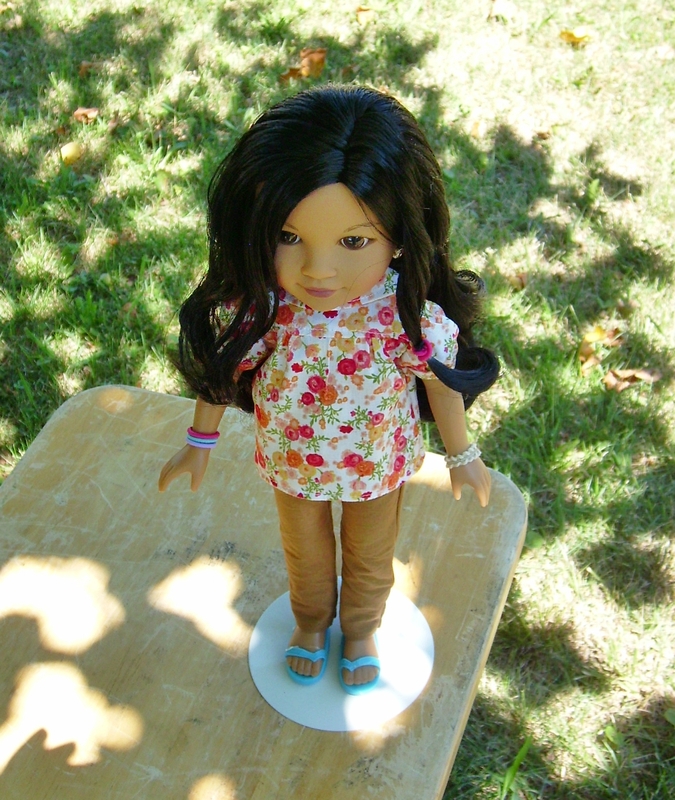 Their dolls are from different areas all over the world and a portion of the purchase goes to charity. 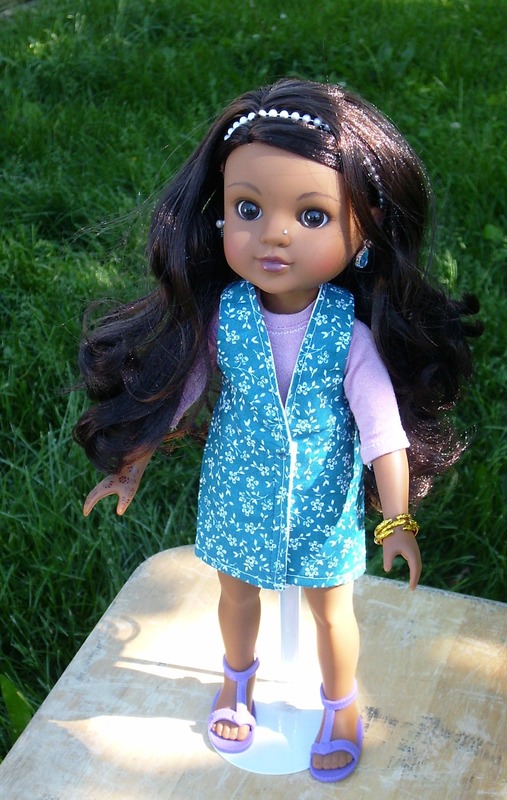 As of right now, there are 4 dolls available: Dell (Kentucky), Rahel (Ethiopia), Consuelo (Mexico), and Nahji. Nahji is from Assam, India. 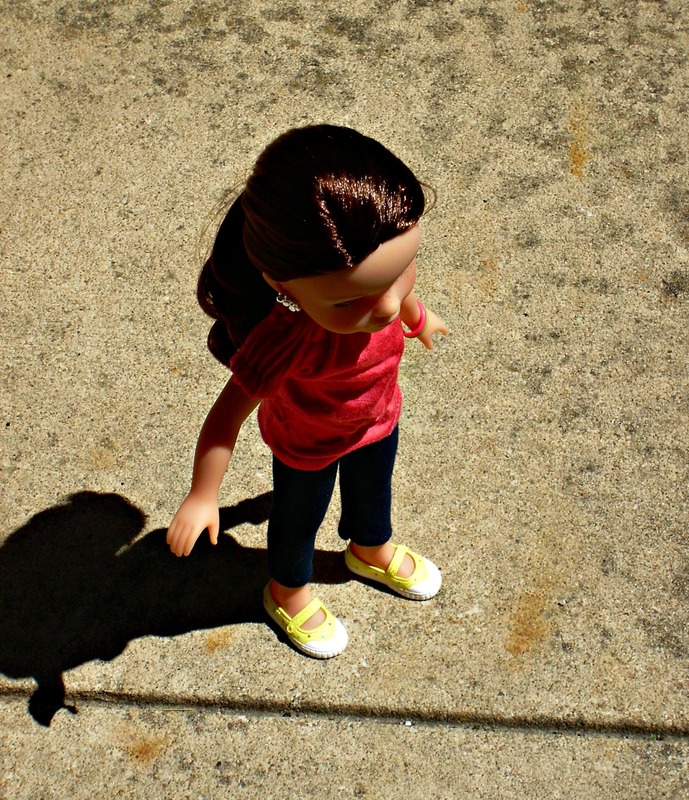 This summer, Hearts for Hearts are planning on releasing another 2 dolls. 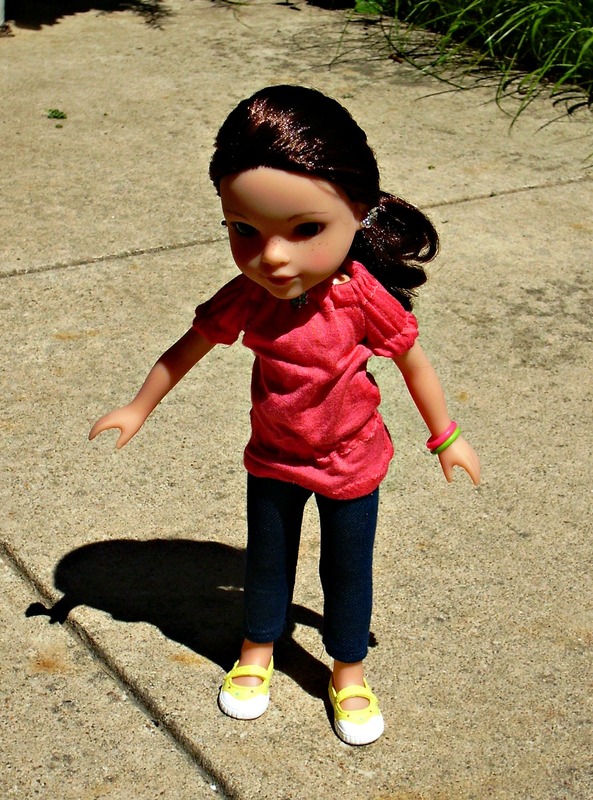 Nahji needed an outfit like the other dolls for Me-Made May too. 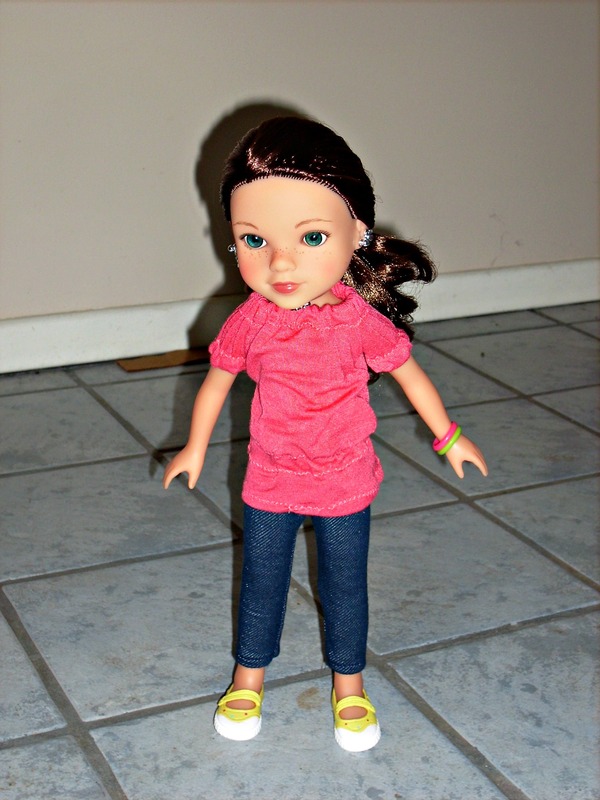 I probably should have used one of the free patterns I got when I purchased my doll off of Pixie Faire’s website. But instead I decided upon using Liberty Jane’s Baseball Tee and the Genoa Jumper. 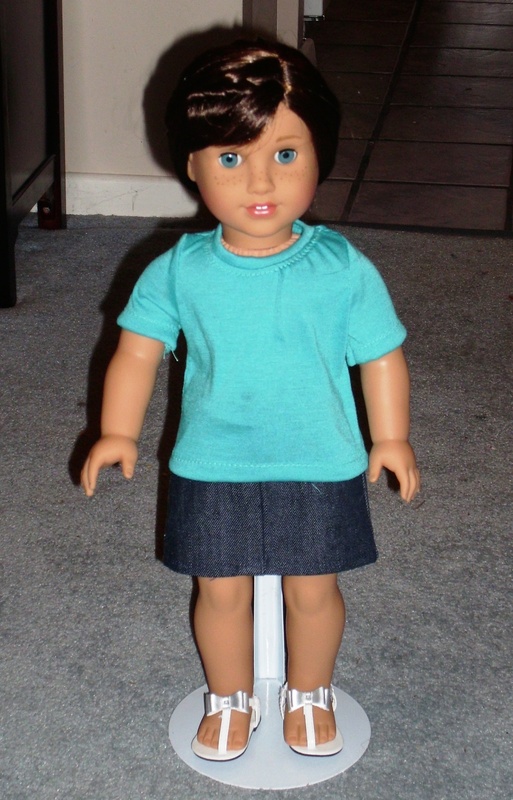 I really liked the American Girl dolls’ version of the Baseball tee so I figured it would be best to start Nahji’s outfit with a pattern I know I like. I had originally planned a coral tee with a brown jumper. But I couldn’t find the brown fabric. 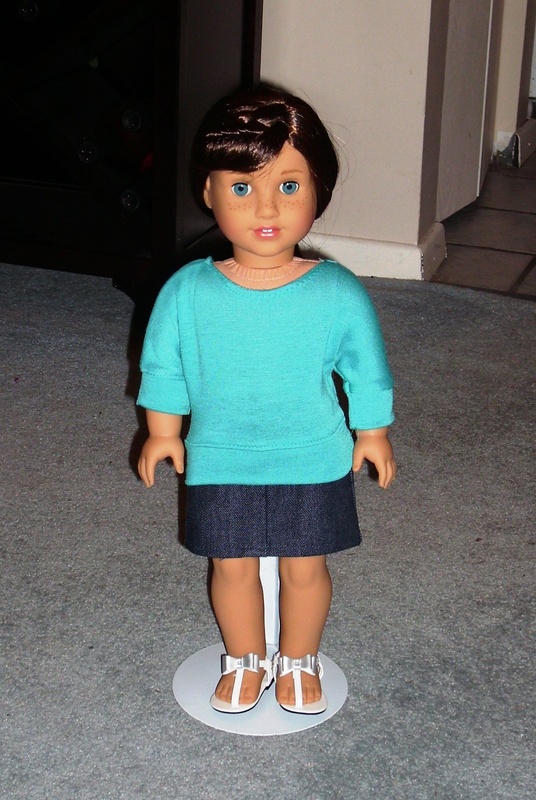 Instead Nahji gets a rose tee with a teal jumper. The rose fabric is some of the scraps of rayon Lycra that I had left over from the Jalie raglan tees I made in February but haven’t really taken photos of yet. This is the Hearts for Hearts specific baseball tee, and it fits Nahji well. The pieces went together so easily. I must have been really distracted by Lala while I was cutting out the Genoa pattern. The lining and fashion fabric didn’t line up at the hem. So instead of following the instructions, I did simplify it and close the side seams with the serger and lined up the bottom. I just surged and turned under the hem so that I made sure I was able to catch the lining in the hem. My sewing machine hates quarter- inch buttons with a passion. Instead, I used Velcro for the closure. I will have to say that buttons do make the outfit. Even with the print my dress is just missing that detail that a button would provide. 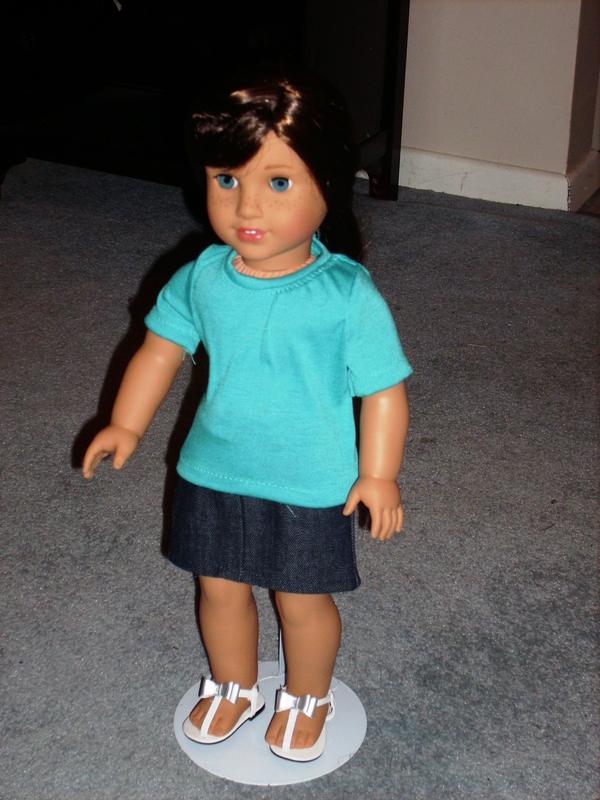 The Genoa pattern is advertised as fitting both 14 inch dolls (like Hearts for Hearts) and 14.5 inch dolls (like the Wellie Wishers). 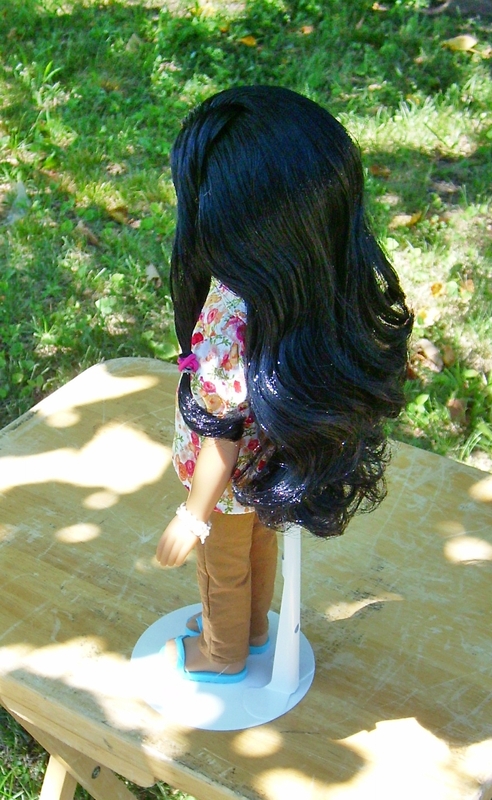 For Nahji, it does seem a little loose but it isn’t drowning my doll. As this is being typed up, I have been anxiously awaiting to hear when Rahel and Consuelo to come (granted I can’t get them until the weekend because I shipped them to my parents’ house). 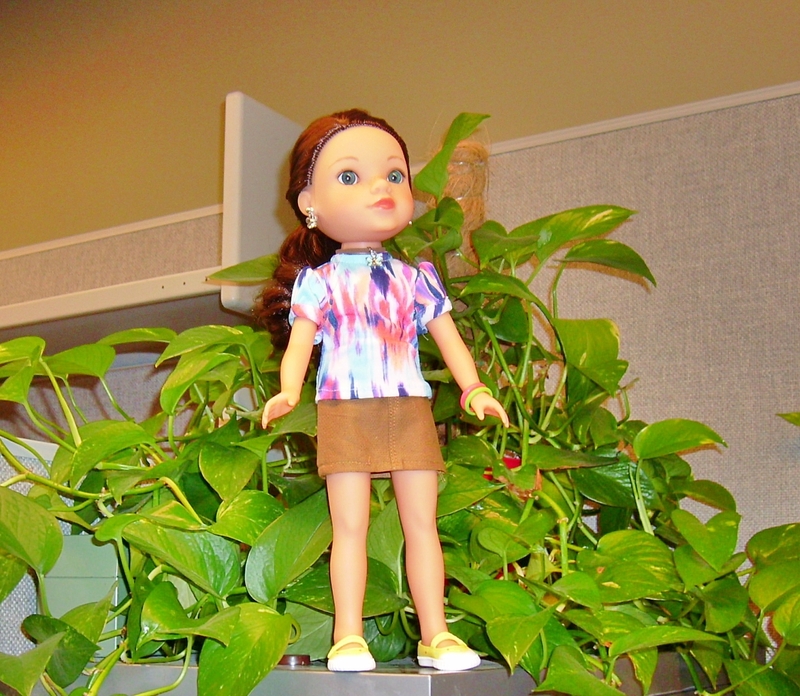 If you are sewing for some lucky girl’s holiday present, more than likely, that doll will need a t-shirt. 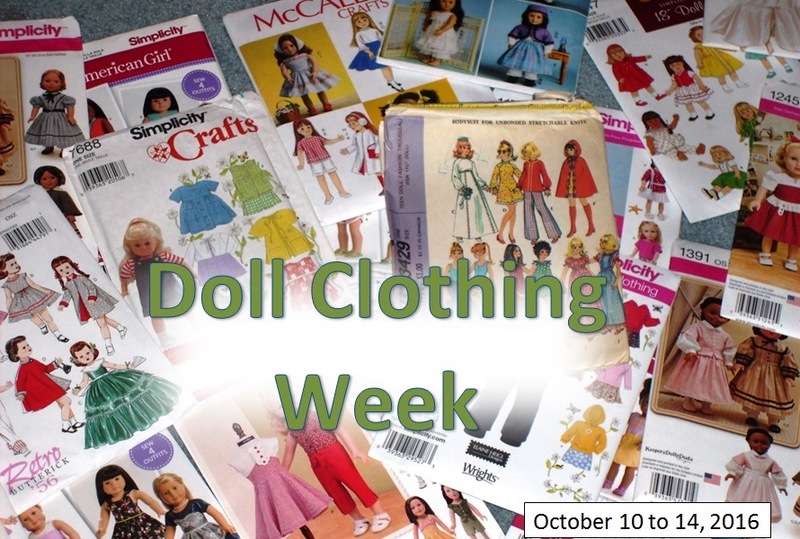 There are probably more doll t-shirts out there than I can actually ever sew. 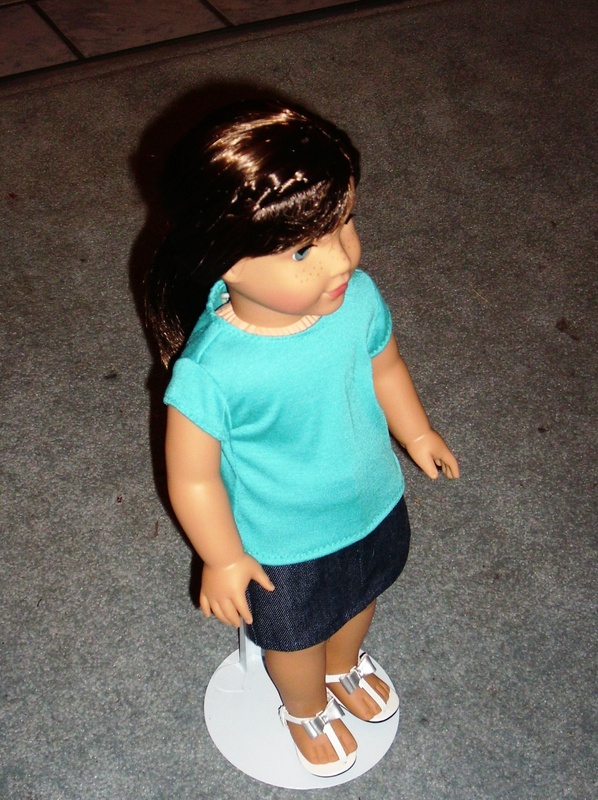 Today my Rebecca and my Grace dolls will be modeling the 5 different t-shirts I made for the T-shirt test. Before getting started, the weather was not the best so I had to do inside pictures. Looking at all the neckbands in the photos, I probably overstretched them as sewing especially since I was trying to make everything on my sewing machine instead of switch back and forth between it and serger. I was trying to recreate how someone just new to sewing would only be using a sewing machine. A fold under and stitched neckline. I stay stitched the quarter inch mark and then turned under and zig zag stitched. The double fold sleeve was pretty tight. So I just did the single fold under and zig zag stitched the hem. It made the sleeve longer but at least I knew I didn’t have trouble with setting in the sleeve or closing up the side seams. Doll It Up Dolman T-shirt is a pull over the doll’s head type of t-shirt. 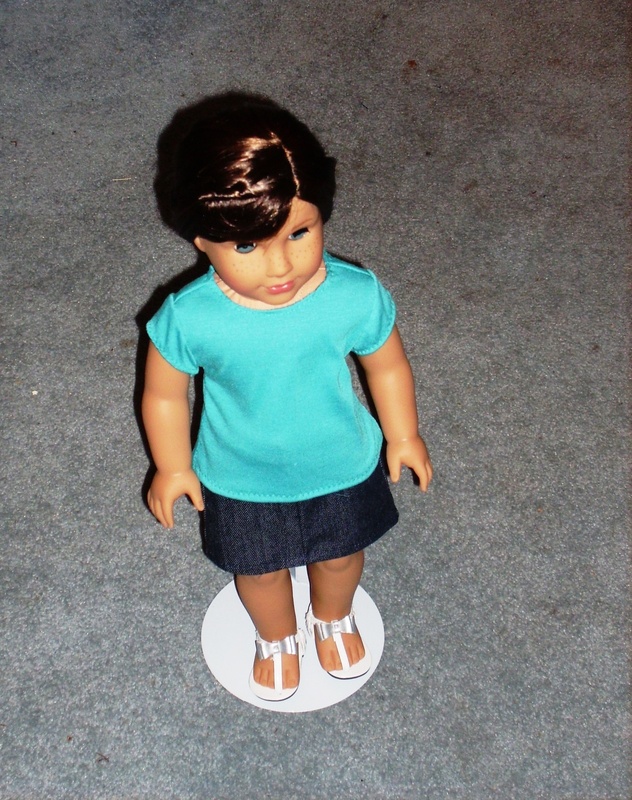 I don’t particularly like pulling t-shirts over my doll’s head so for that for any future makes of this pattern I will add seam allowances to the back so that I can add Velcro to the back for an easier to put on t-shirt and not mess up my doll’s hair. This was hard to put on and take off. A fold under and stitch neckline which I stay stitched the quarter inch mark then turned under and zig zag stitched. Neck band which is like what a girl would find in ready to wear. I really wish there was a small box with the neckband bias marked in the pattern pages. As this is a PDF pattern, I don’t usually have the computer up with the instructions as I am cutting pattern out.See above. I actually had to go back and fix the t-shirt after completed because I found out about the neck band so that is why my neck line is stretched out. Otherwise, the pattern pieces fit together nicely. Probably more of a boyfriend shirt style of fit. Neckline band! That is probably the finish one would expect to see in Ready to Wear. Easy opportunity to color block which means that it could use smaller scrap from projects. Neckline band! I really just love this. Choice of long or short sleeves. All these t-shirts were made with teal poly/ lycra knit from Fabricmart. 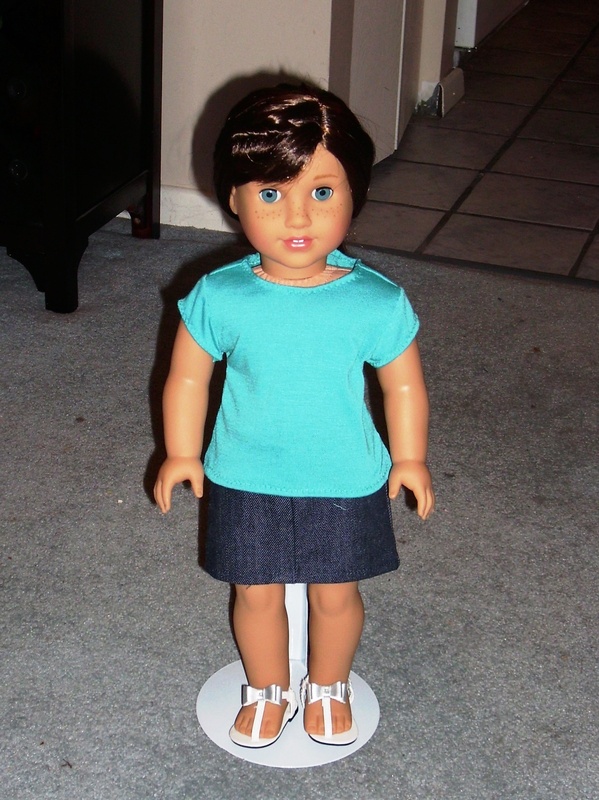 All the doll models shown in the pictures are modern American girl dolls. 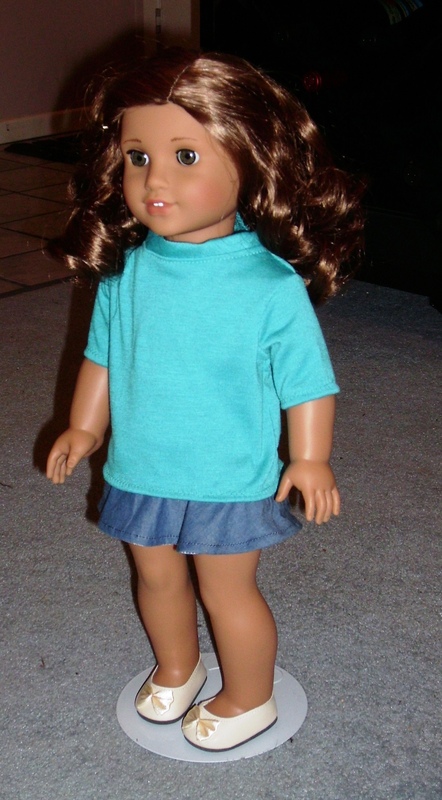 I didn’t use any of the older dolls in my collection which are more stuffed than the current dolls made. 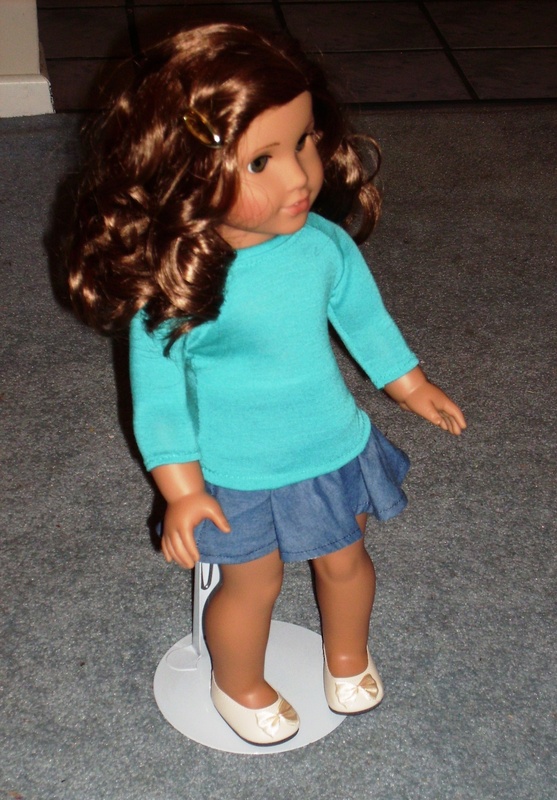 As always, there will be slight variation per doll. Stunning Handmade Jewellery. Gorgeousness personified! Got 99 problems but a pocket ain't one.